Need a reason to eat more vegetables? Here’s one very good one. 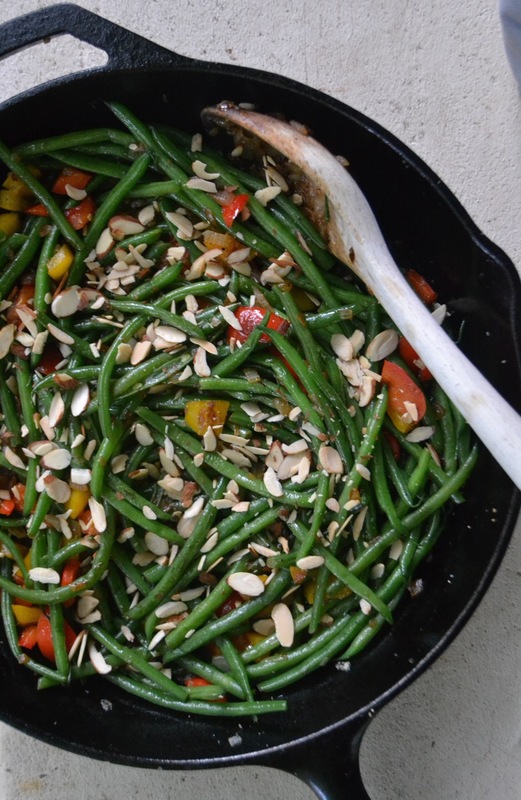 This colorful side dish comes together quickly especially if you blanch and shock the beans in advance. Don’t omit the toasted almonds. They add great crunch and make a beautiful finishing touch to this company-worthy side dish. Happy cooking! Bring a medium saucepan of generously salted water to a boil. Add the green beans and cook for 3 to 5 minutes after the water returns to a boil until they are crisp tender. Drain the green beans in a colander and add them to an ice water bath (a large bowl filled with ice and water) to stop the cooking process. This technique is called shocking. When the beans have cooled, drain them and set aside. 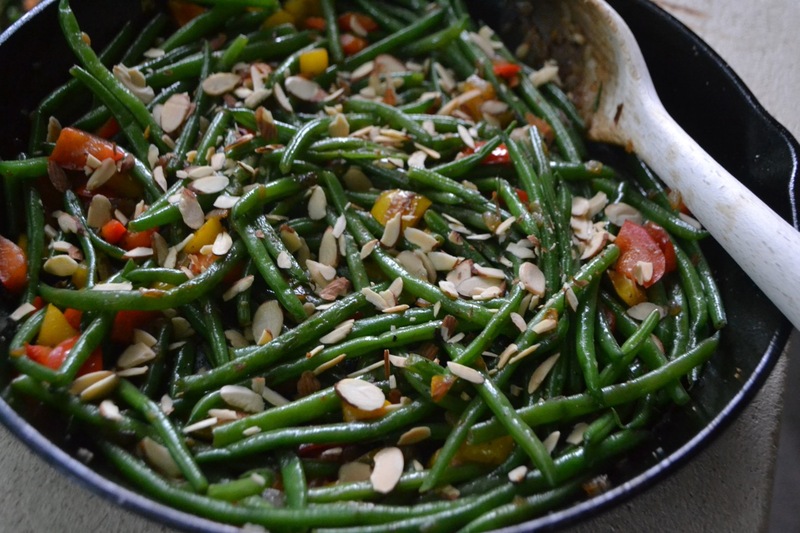 Note: Green beans can be prepared up to a day in advance using this method. Drain the beans and then place them in an opened Ziploc bag with a paper towel. Refrigerate until ready to serve and then proceed as follows for reheating. Heat a 12-inch skillet over medium-high heat. Add the olive oil and then the onion to the pan and cook, stirring occasionally, for about 3 minutes. Add the chopped bell peppers and cook, stirring occasionally, until they soften. 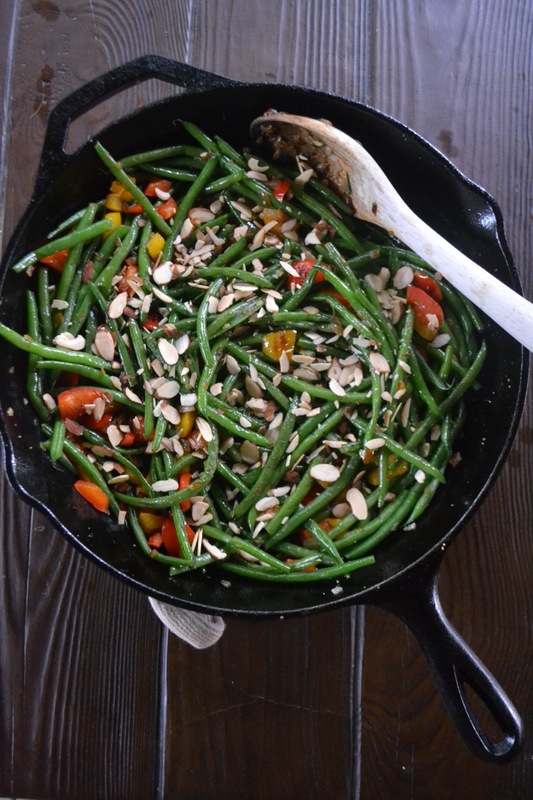 Add the green beans to the skillet and toss everything together until hot. Season to taste with salt and freshly ground black pepper and sprinkle with the toasted almond slices. Serve immediately.